Today’s guest post has some lovely ideas on glass verandas, and great tips for styling up your exterior. Enjoy! Add a touch of alfresco luxury to your lifestyle with the help of customised glass veranda. An expertly crafted veranda is the perfect way to extend your garden’s possibilities, providing you with ample cover and shade while you enjoy the tranquil outdoor experience. With no external walls, a veranda not only enables you to enjoy your garden view all year round, but also protects you from the unpredictable UK weather. Whether it is to escape the harsh effects of the summer sun or keep the rain and snow at bay, a glass veranda is the ideal option. Enlist the help of experienced specialists like 123v Plc and choose from various styles before their experts begin to design the bespoke glass canopy project. The provision of a wide range of glass veranda design concepts means fittings are not only ideal for the home, but also for commercial use as walkways or smoking shelters. 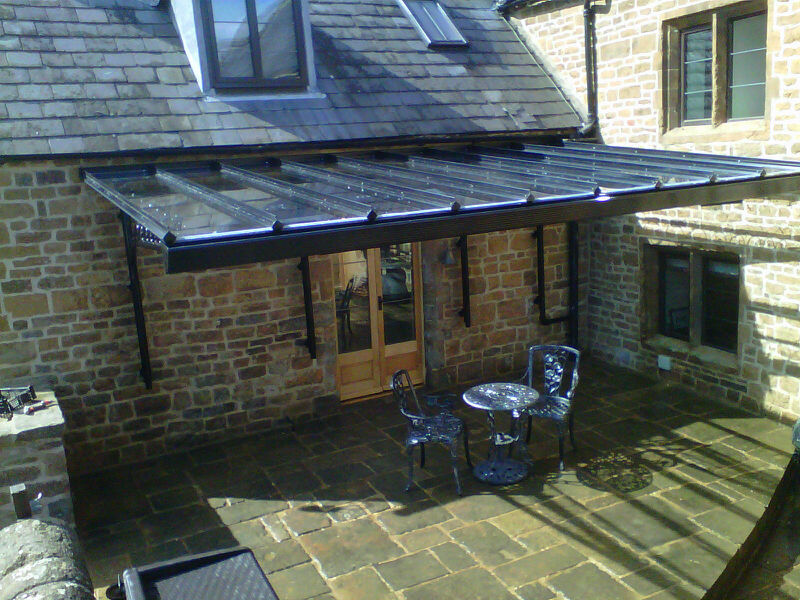 If you are planning to redesign your garden’s layout, a glass veranda can be the ultimate addition. It can not only serve as an extension of our outdoor living space but also add considerable value to your property. The veranda design can be planned in such a way that it complements your patio space, paving and other arrangements of your property. By installing such a structure, you will have a unique construction that is both aesthetically pleasing and also suits your surroundings. Verandas can also be designed to blend perfectly with the theme of your garden. Many garden projects are arranged on the basis of a specific theme, and the furniture used on each patio is different. 123v takes special care and attention in the design of different outdoor living solutions. You can also consult them if you would like your design to be further customised to capture your mood: enjoy disco lights or dim lighting during the evenings. Enjoy more leisure time outdoors, within the privacy of your own home. A veranda offers a bright and sheltered space that can be used all year round for various leisure pursuits such as summer BBQ events, reading a book or snoozing in the afternoon sun. Although these stylish installations are enclosed, they can also be designed to create a vivid sense of space. As such, they provide a sheltered space without diminishing the light, thereby giving you the perfect outdoor-indoor experience. Enjoy all the comforts of indoor living… outside! From aesthetic appeal to functional benefits and weather protection, a glass veranda is a highly practical investment for your property. What’s the Best Garden Furniture Material? An interesting alternative to a conservatory…with no walls, I like the idea! These looks excellent and classy too. I have always been a fan of glass verandas. But i am attracted to them because of their exquisite look .